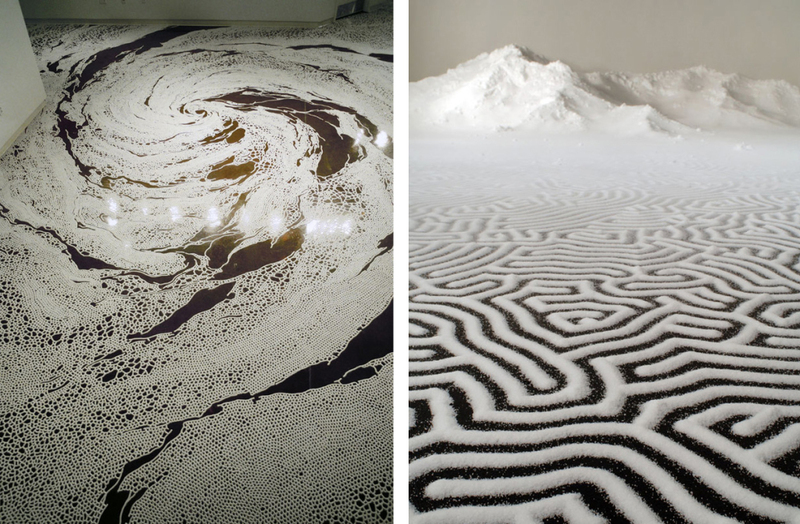 Japanese artist Motoi Yamamoto creates intricate temporary installations using salt — an essential material for both the human body and the ocean. He pours the tiny grains into images that look very different far away than they do up close — maze-like, lace-like, map-like, nature-like, and tempest-like patterns that are specially designed for the installation space, and then are swept up by gallery patrons returned to the sea at the end of the exhibitions. Drawing a labyrinth with salt is like following a trace of my memory. Memories seem to change and vanish as time goes by. However, what I sought for was the way in which I could touch a precious moment in my memories which cannot be attained through pictures or writings. What I look for at the end of the act of drawing could be a feeling of touching a precious memory. For a deeper dive, this 12 minute documentary by John Reynolds & Lee Donaldson explores Yamamoto’s breathtaking work further.